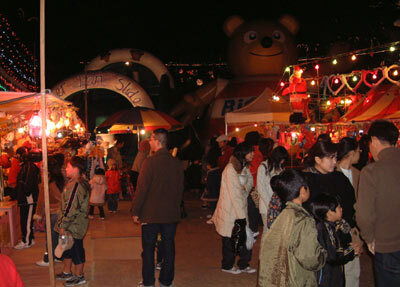 Starting last weekend, Christmas Fantasy was held in Okinawa Kodomo-no Kuni (Children’s Land) zoo pasrk in Okinawa-city. Although the weather was unfavorable for a festival, surprisingly large crowd of people attended the event. 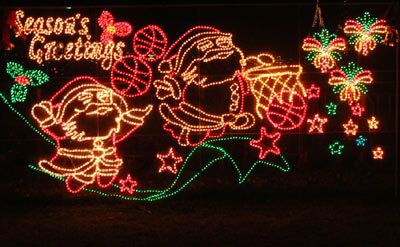 At the venue, there were impressive illumination displays featuring millions of light bulbs attracting visitors. On the stage, people enjoyed watching salsa and street performances by Latin Soul and Teeda Family. Mami & Coche Canela presented a Christmas concert to the enthusiastic audience. 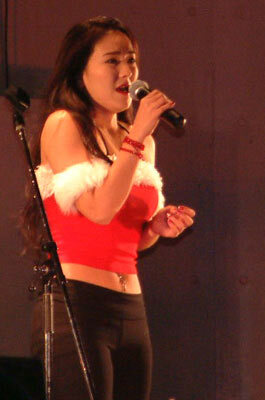 Yoshinori Morimoto, a resident of Uruma-city, attended the Christmas Fantasy with his girlfriend. “I came here last year too. I like this event very much,” he said. The event continues from this Friday through Wednesday, Dec. 27. It is open every day from 4 to 10 p.m.
Organizers highly recommend that visitors use additional parking lots located in Okinawa City Office and Awase Seaport as the parking at the Okinawa Zoo Park is rather limited. A shuttle bus will run continuously between the additional parking and the zoo during the event.